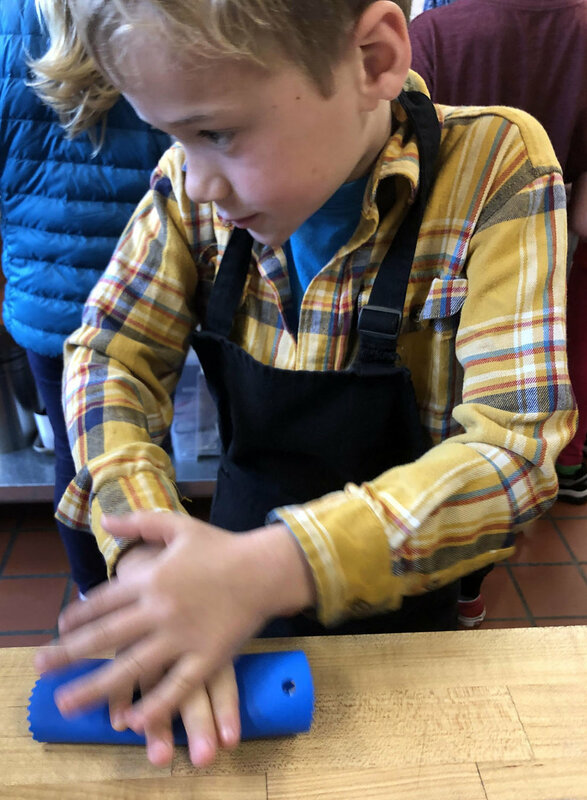 We’ve already posted about the temaki lesson from the last session of Rock and Rollers with grades K-2 this semester, but these photos from our last class with grades 3-5 were too sweet not to post here! 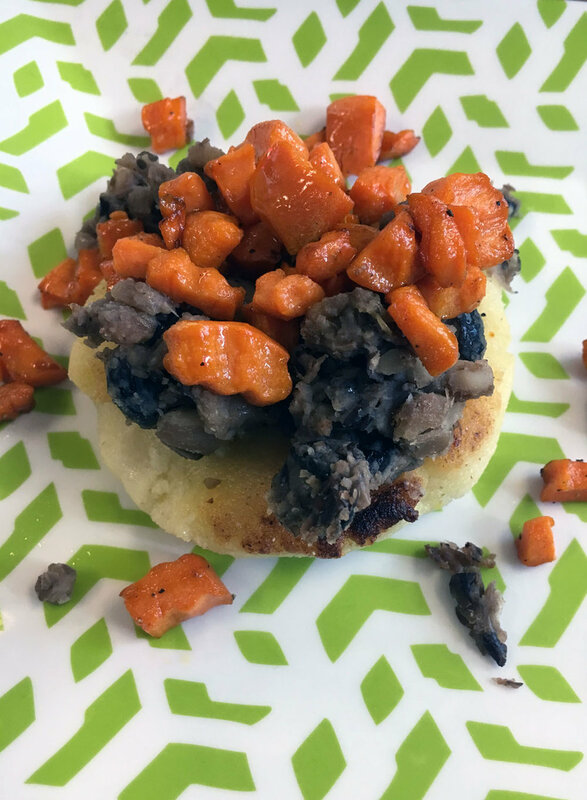 The finale of our three-week unit on Native American food cultures featured wild rice harvested by hand by the Red Lake Nation, a band of Chippewa Indians in Minnesota. We started the class by watching two videos: Food That Grows on Water and White Earth Wild Rice Harvest. The students were impressed at how the Chippewa pole their way through the rice in canoes and how they harvest the wild rice (which are actually grass seeds) with the help of two sticks. We made a simple pancake batter and incorporated cooked wild rice as well as another ingredient from the Chippewa diet, cranberries. 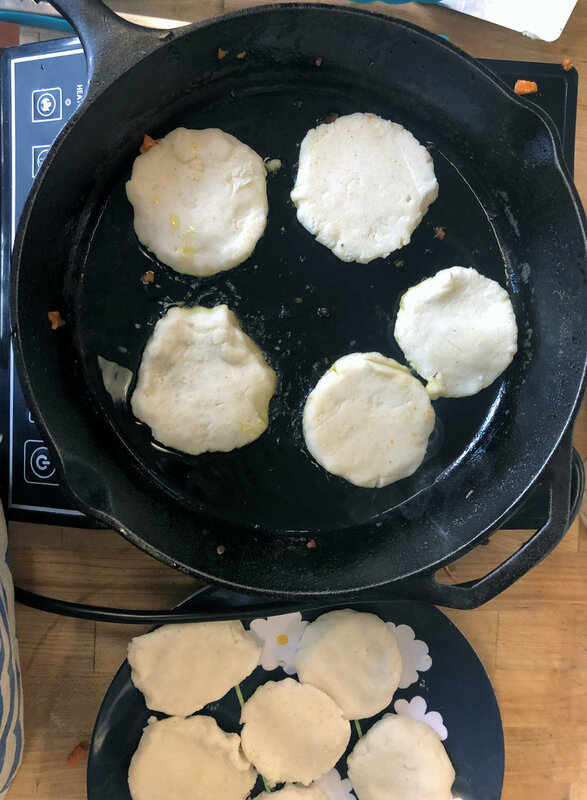 Room 202 made small pancakes and Room 201 made giant ones. All were topped with pure maple syrup, a food Native Americans produced long before Europeans arrived on the continent. We closed the class by going around the circle and sharing a highlight of our time together. 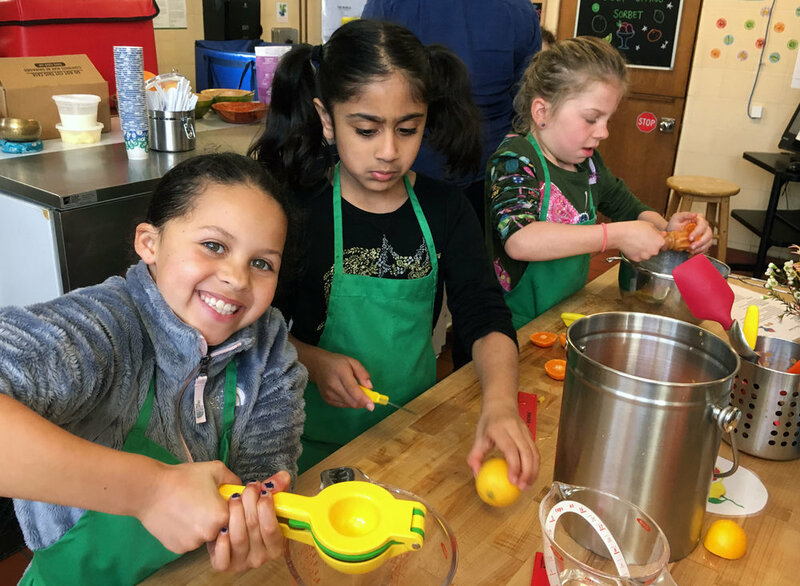 We feel so grateful to have shared these brief but meaningful culinary adventures with our graduating fifth graders and look forward to more time in the kitchen classroom next year with the fourth graders! 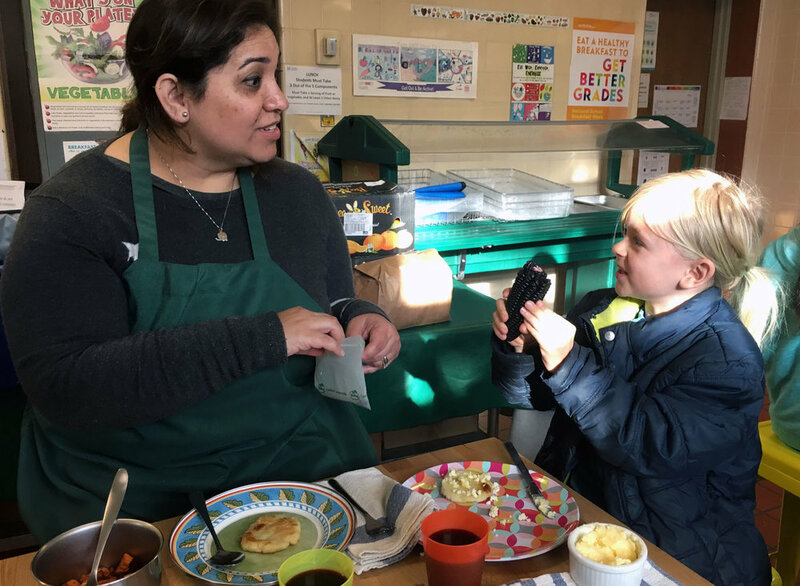 Our students have always asked when we would make a breakfast from the United States, so this week we celebrated one of our country’s indigenous breakfast foods, grits. Grits come from the Native American Muskogee tribe, the people who first ground corn in a stone mill, giving the dish its signature coarse, gritty texture. 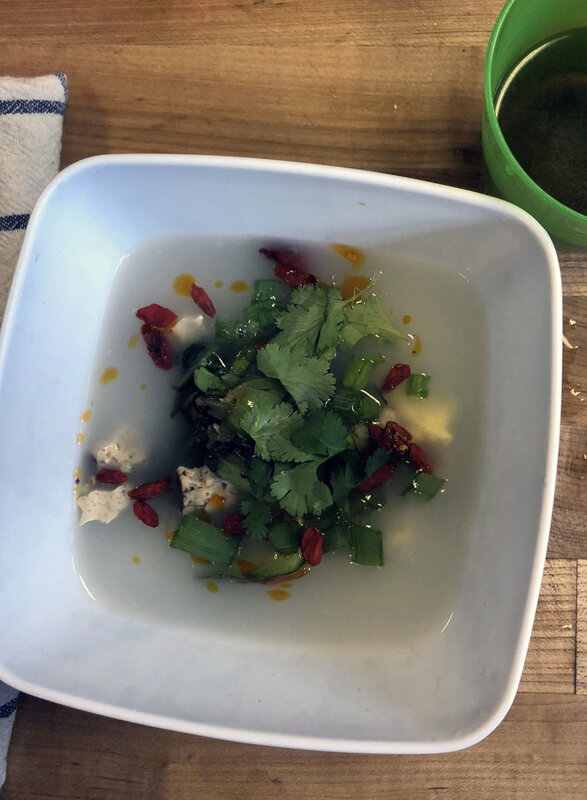 We compared grits to the oat porridge we cooked from Finland and the rice porridge we cooked from China - all of these food traditions revolve around a thick mixture of cooked grains or seeds served with delicious toppings. 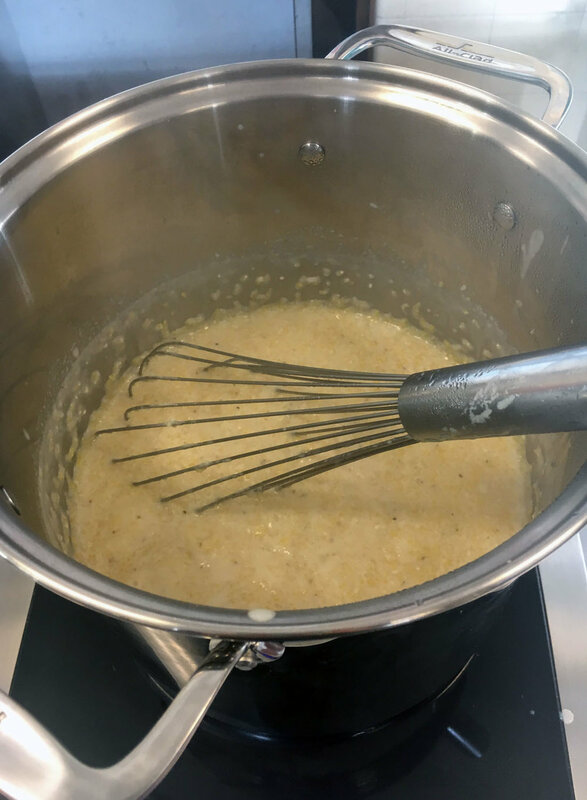 We worked with proper South Carolina stone-ground grits, both yellow and white, cooking them with whole milk and vegetable stock to form a savory base for our meal. Then we shook our own butter, sautéed the first asparagus of the season with garlic, grated cheddar cheese, snipped green onions, diced peppers, cut lemons, and minced parsley. We didn’t even miss the shrimp, and it was fun to hear a couple of kids remark that they would try and eat grits every morning from now on. 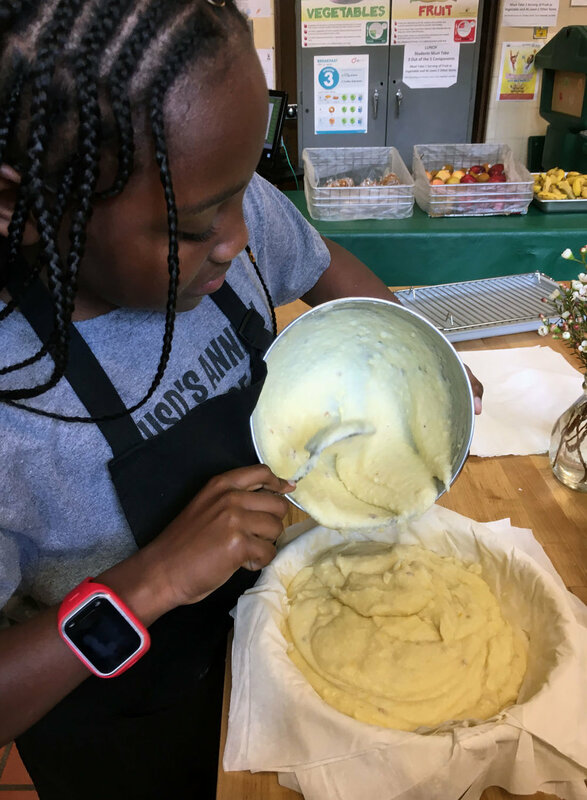 This week, the fourth and fifth graders prepared Three Sisters Stew from the Chickasaw Nation, which today is located in Oklahoma. 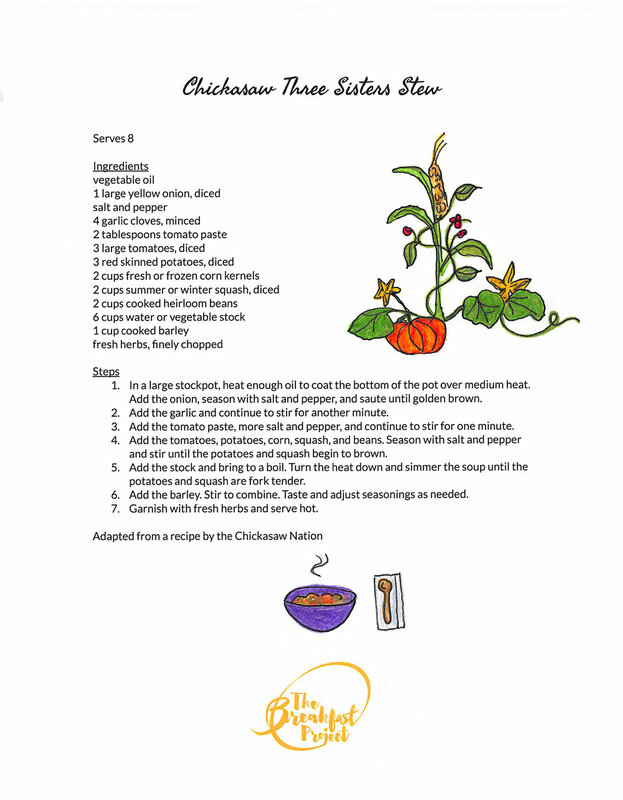 The Three Sisters refers to the Native American tradition of planting corn, beans, and squash together. The corn provides a structure for the pole beans to climb, the beans provide nitrogen to the other plants, and the squash plant’s low, broad leaves prevent the growth of weeds, provide moisture retention for the soil, and its prickly vines ward off pests. Whereas last week’s class focused on the diet of the Ohlone, who were predominantly hunter gatherers, this week we talked about largely agrarian societies like the Chickasaw. Several Native American tribes developed the Three Sisters method of companion planting over thousands of years. Students started by sautéing onions with freshly minced garlic. They added cut-up summer and winter squash, red potatoes, and pre-cooked Cannellini beans and barley. Our homemade vegetable stock contained beet greens, which gave the stew a beautiful deep red color. 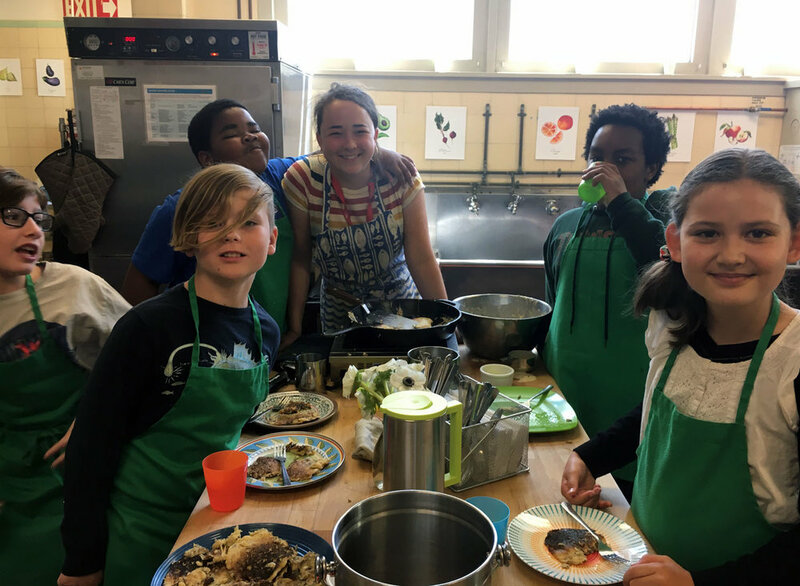 While the vegetables were cooking in the stock, we set the table, then garnished the finished stew with fresh herbs from the Harvey Milk school garden. 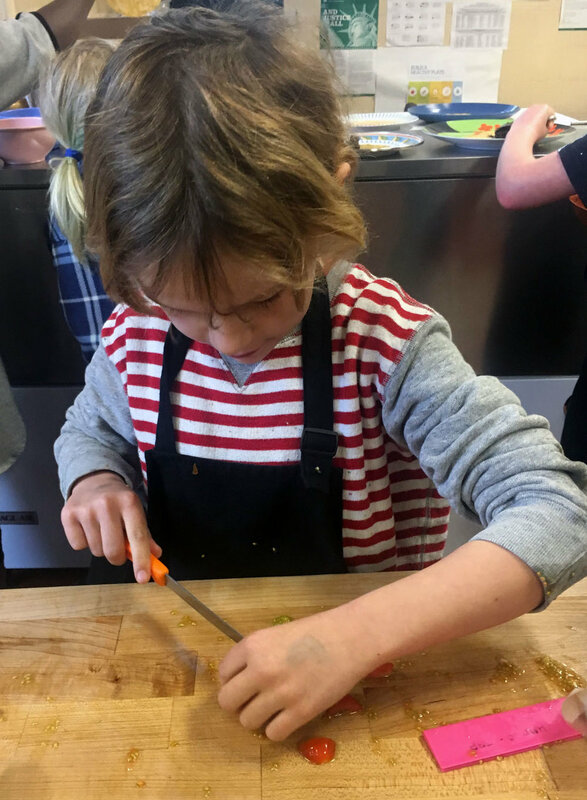 What we love most about the fourth and fifth grade classes is how focused they are on the many kitchen jobs we have and how strong the curricular connections are between what they have studied in the past and what they’re experiencing with all their senses in the kitchen classroom. 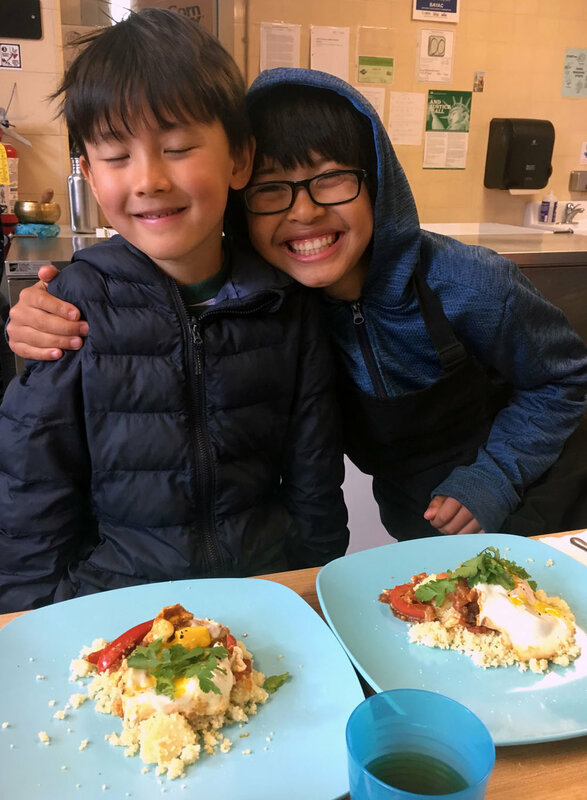 This week we made shakshouka, a North African breakfast of eggs cooked atop stewed tomatoes and peppers that was a favorite last year when we first taught Breakfast Around the World. We served ours over the national dish of Tunisia, couscous. On Thursday, we had a special visit from Harvey Milk parent Yafah and first grader Lilah, whose family has roots in Morocco. They told us they add jalepeño and lamb sausage to their shakshouka and eat it with French baguette instead of couscous. 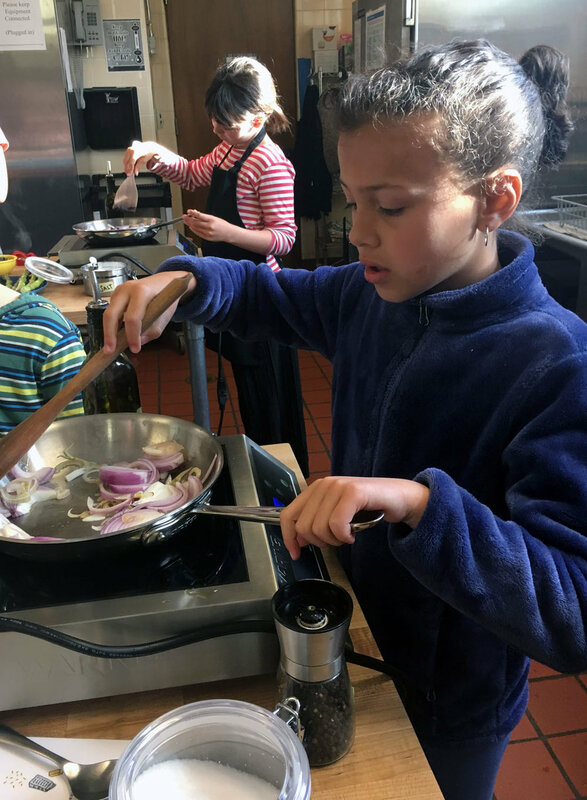 Students built the stew by sauteing onions and garlic, adding the tomatoes and peppers, and deepening the flavors with cumin, sweet paprika, and a bit of cayenne for a kick. The final additions were the eggs on top, which our young chefs cracked with confidence. We covered the pan, allowing the yolks to just set, then served the shakshouka over a bed of couscous with the traditional Tunisian pepper paste harissa on the side. We made fresh summer rolls (gỏi cuốn in Vietnamese) this week that feature edible rice paper for the wrapper. 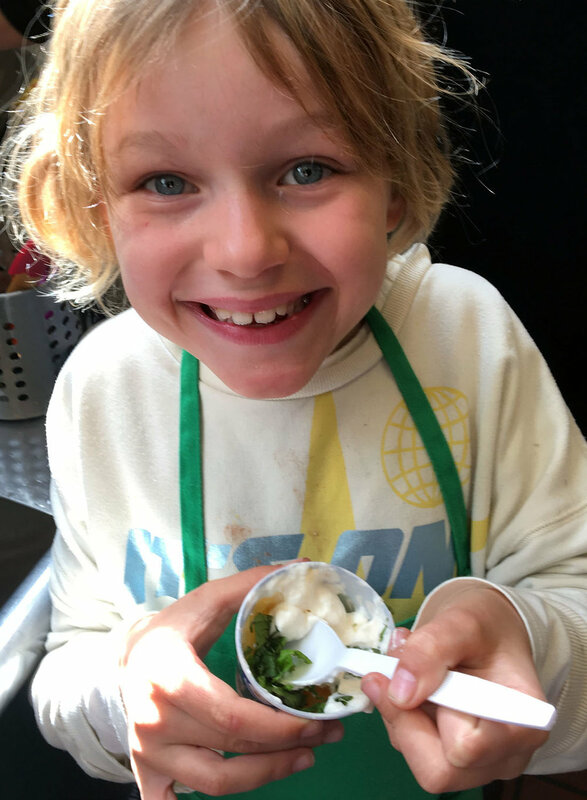 Students prepared lettuce, carrots, cucumbers, mint, basil, cilantro, tofu, and calendula petals for the filling, then dipped the wrappers in water to rehydrate them before rolling. We had some rice noodles tossed in sesame oil as a base, and each of us was able to roll and eat three to four rolls! Some were skeptical of the traditional nước mắm dipping sauce until they tasted it. Then they couldn’t get enough of the salty, sweet, acidic condiment. Technical difficulties prevented us from listening to Vietnamese rock band Bức Tường, but luckily our chefs happen to be excellent conversationalists. 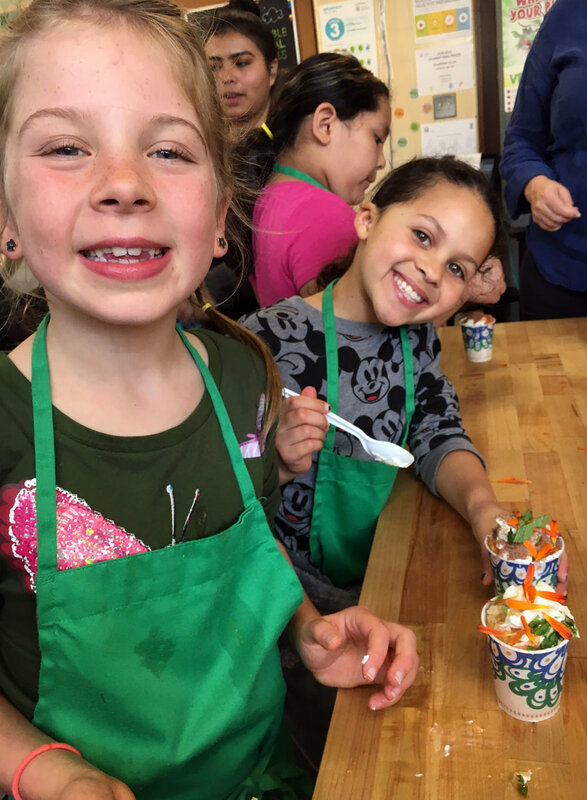 After school is one of our favorite times with the kids because they are so witty, relaxed, and enthusiastic about the work. 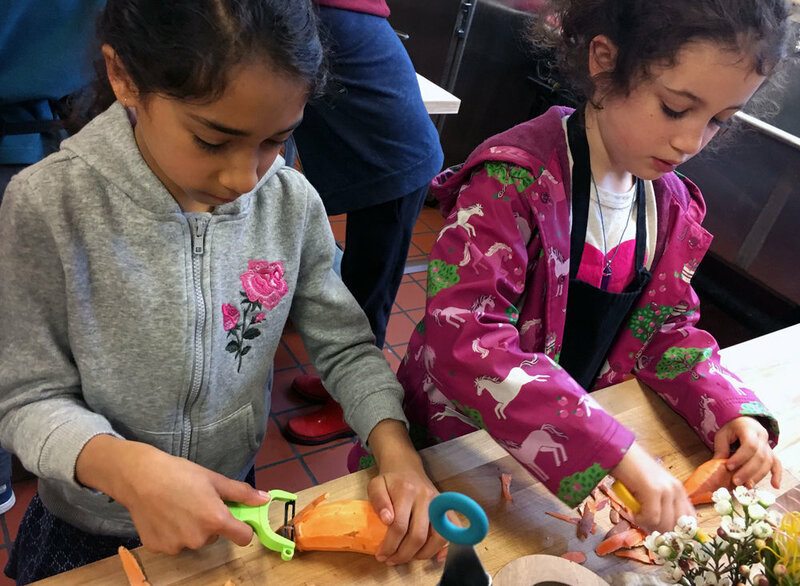 We had a wonderful start to our fourth-and-fifth-grade unit on Native American food traditions and food culture this week. We started in the classroom where students shared what they knew and questions they had about the Ohlone, the native peoples of the San Francisco Bay Area. What did they eat? What did their languages sound like? How many tribes were there? 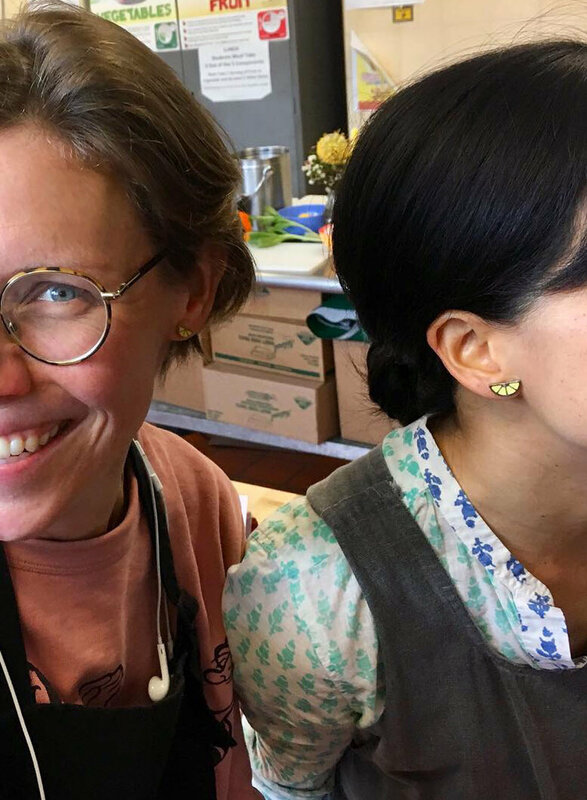 We then watched a video about two Ohlone chefs who are keeping indigenous food traditions alive at their cafe in Berkeley. (We are working with their organization to arrange a visit to Harvey Milk later this spring!) One takeaway that many of us found powerful about the video is that the Ohlone are still here, still gathering together, still a part of our modern-day local community. We started class this week with a mix and mingle activity. Students moved around the classroom while listening to excerpts from Vivaldi’s The Four Seasons and were asked to share with a partner their thoughts about winter, the season we are leaving behind, and what they’re looking forward to about spring, which is just around the corner. Epic second-grade ballet and air guitar ensued. Then we watched a video about how different cities around the world celebrate spring. 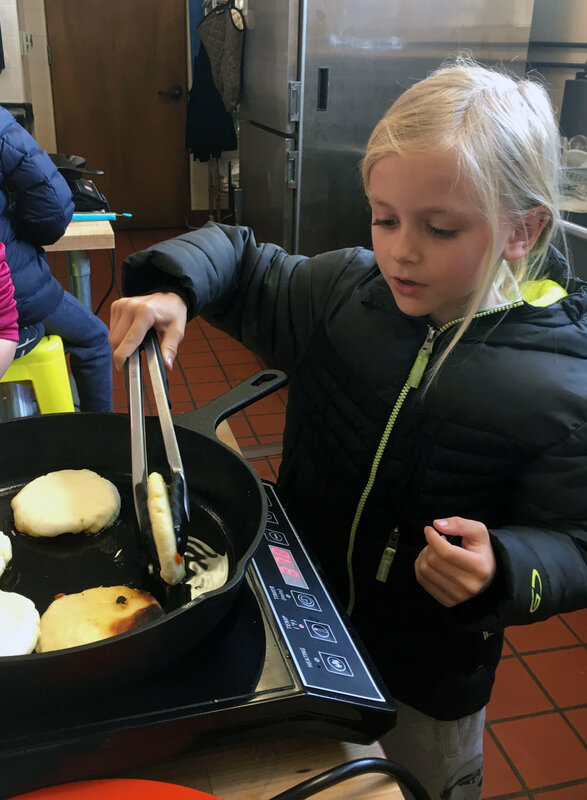 In the kitchen, students got to work with the new salad spinners and food processors The Breakfast Project recently acquired with the District 8 participatory budgeting money we won last year. 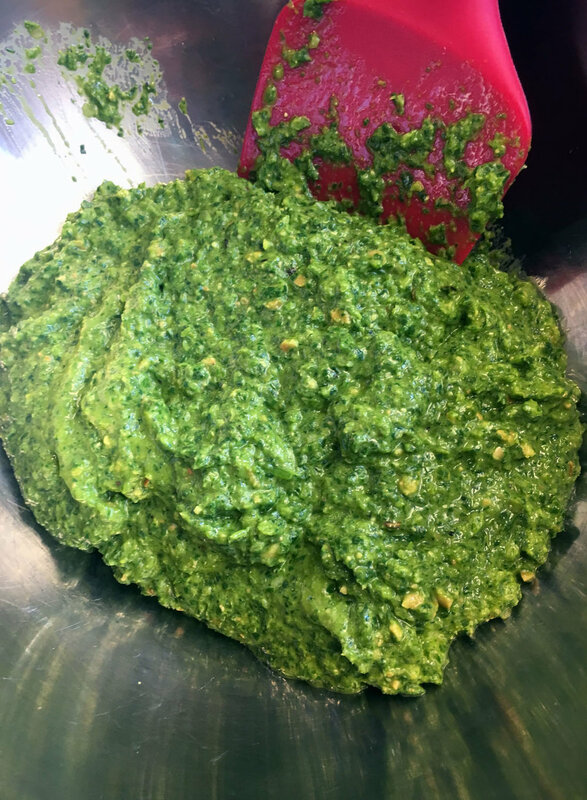 The food processor bowls filled with fresh spring goodies like green garlic, fava leaves, mint, and dill. Instead of the pine nuts traditionally used in a pesto recipe, we used dried edamame. 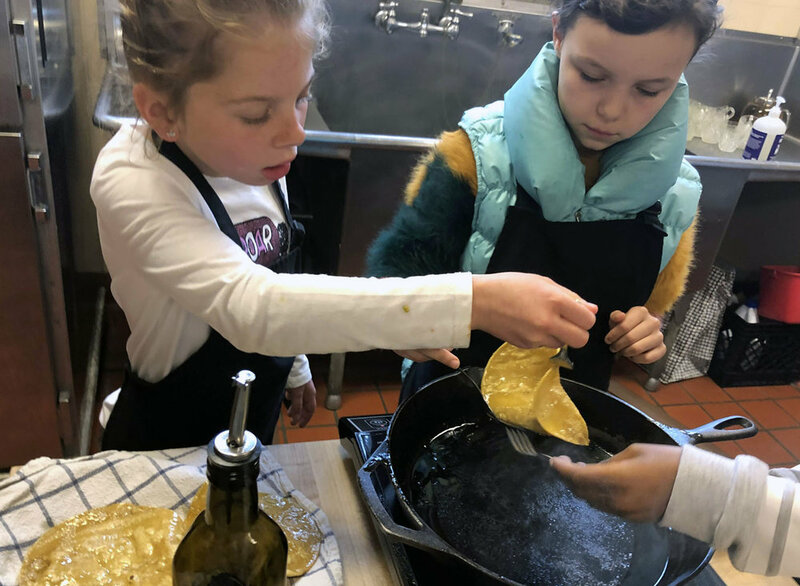 Second graders added a little lemon juice, salt, and pepper, then processed away while drizzling in extra-virgin olive oil. We tasted as a table and adjusted the seasonings, then slathered the bright green pesto on some Tartine sesame bread and topped it with the winter refrigerator pickles we made last week. A final dusting of edible (Brassica!) flower petals from the school garden and some Parmigiano Reggiano cheese completed these mini edible works of art. Spring is definitely in the air! 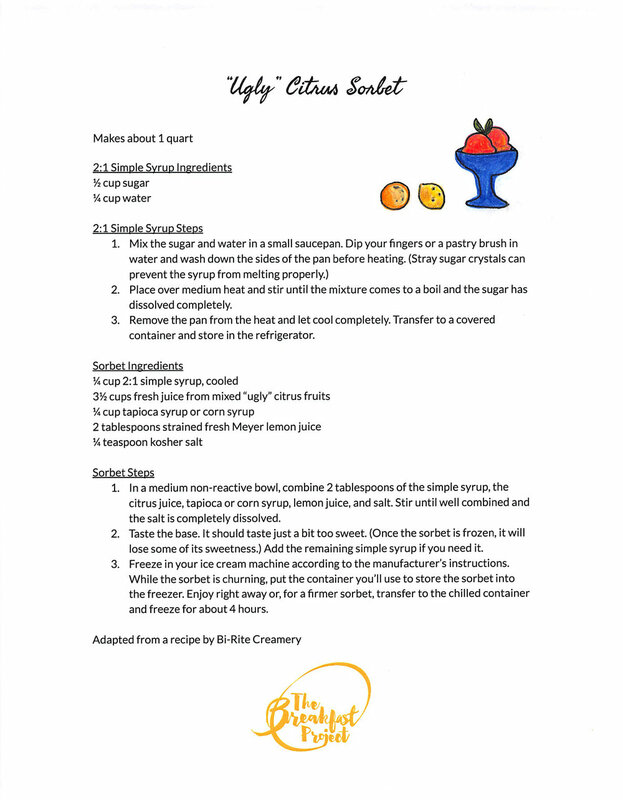 A parent from our community generously donated two June smart ovens to us, so we thought we’d give baking a go this week. 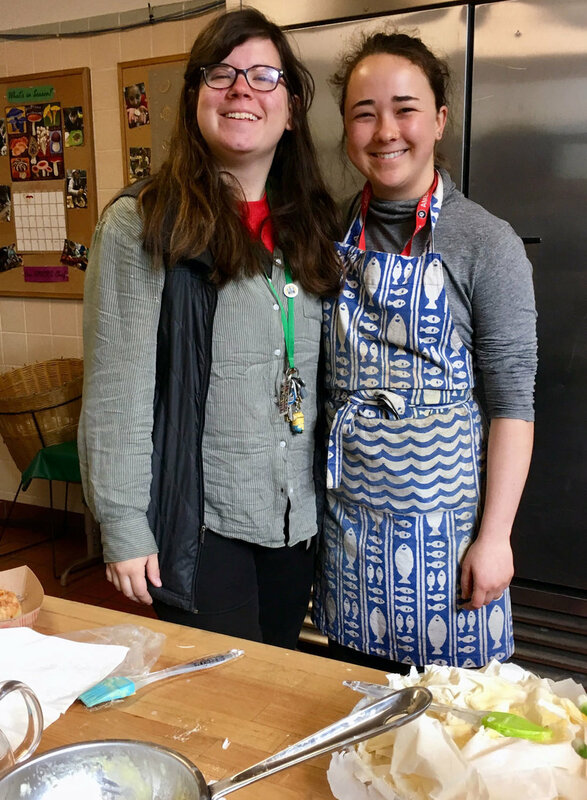 Just in time for Pi Day, students made galaktoboureko, or milk pie, from Greece, which is basically a custard made from semolina (not dissimilar in taste and texture to Cream of Wheat cereal) wrapped in many layers of buttered phyllo dough. Everyone had a lot of fun working with the tissue-thin sheets of phyllo. Because our class time doesn’t allow for the entire start-to-finish baking process, which involves letting the pie cool and drizzling it with sugar syrup, each class baked pies for the next day’s class. This means we had many slices to serve at the parent faculty club meeting on Tuesday night as well as to give away to the incredible teaching and support staff at Harvey Milk every morning this week. The phyllo is very forgiving - if it tears, it just adds another flaky layer to the final result. I must say the pies the kids made were simple to prepare yet looked magnificent and tasted even better. Hooray for pi and pie! We were delighted to welcome back to the kitchen this week some of the older chefs we haven’t seen since our Soup Squad classes in December. 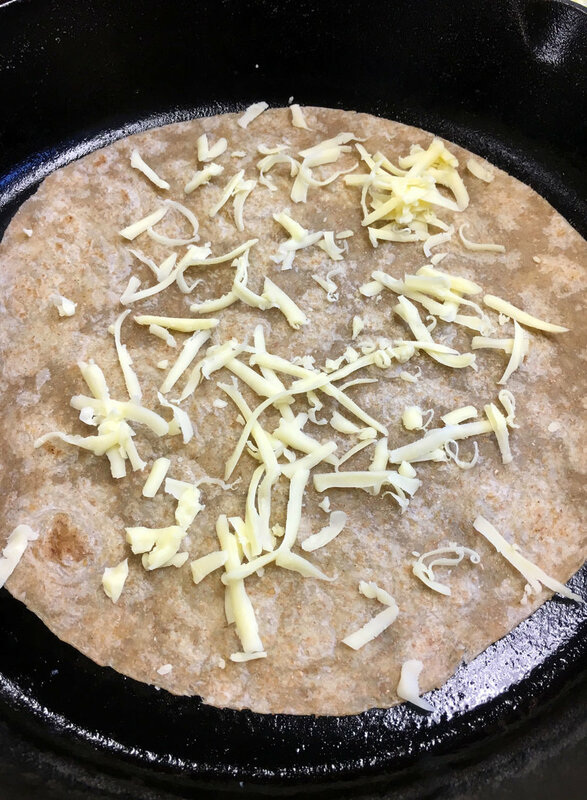 Our first rolled food comes from Mexico, home of the burrito. 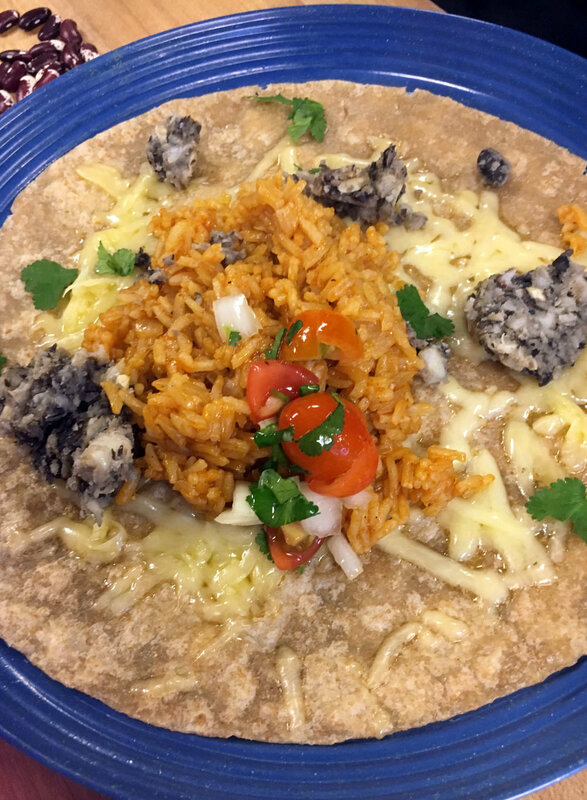 Students made a fresh salsa, grated cheese, and prepared a pot of Mexican rice with fresh garlic, tomato paste, cumin, and chili powder. While the rice cooked we played a rousing game from Mexico called Lotería! Then we assembled our burritos and listened to the Mexican band Los Teen Tops, which reminded us all a lot of the music of Elvis Presley. 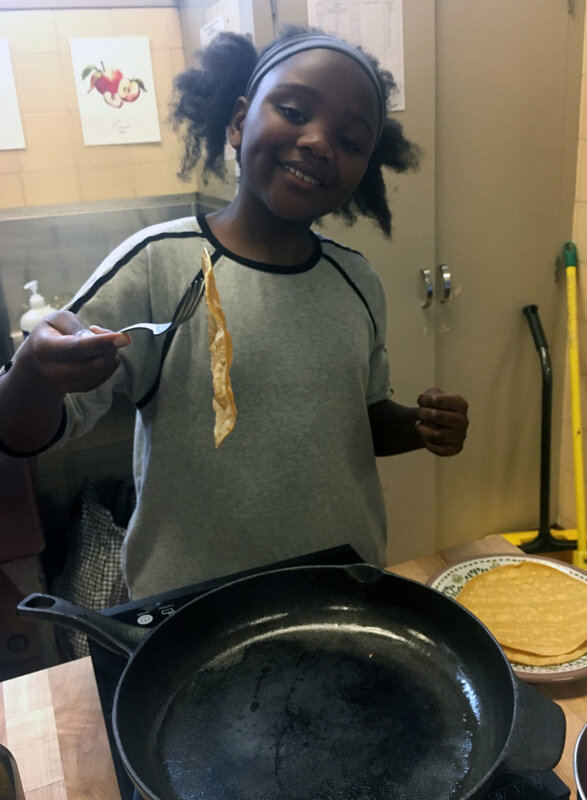 When class was over, students were excited to make extra burritos to share with their teachers and friends in the rest of the after-school program! We started class this week by discussing how humans have used the art of food preservation to slow the decomposition process of animals and plants for thousands of years. 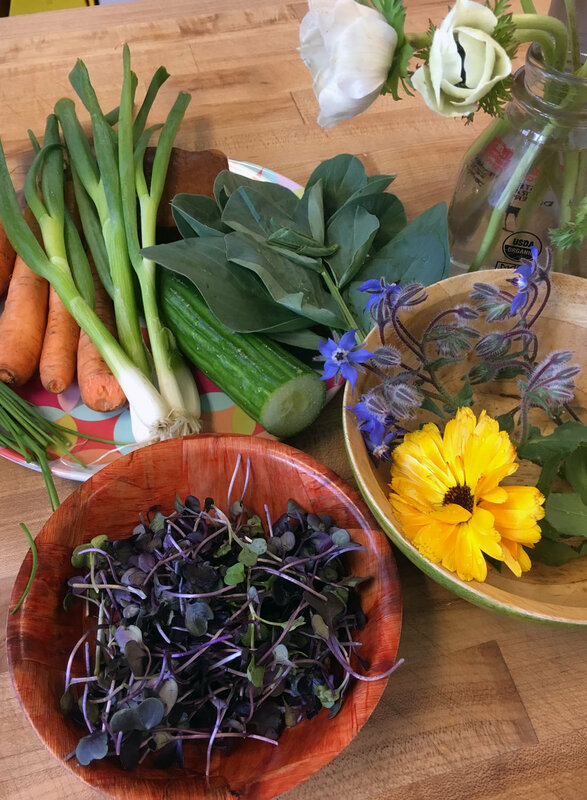 Preserving the summer bounty not only ensured that families could survive through the harsh winter months, but processes like fermentation also added new flavors (e.g. milk preserved as cheese) and nutritional value (e.g. cabbage preserved as kimchi or sauerkraut) that weren’t present in the original ingredients. In the Bay Area, we’re lucky to have a winter bounty in addition to a summer one, so we made winter refrigerator pickles this week from local produce, preserving watermelon radishes, carrots, and romanesco. We’ll eat them in class next week. 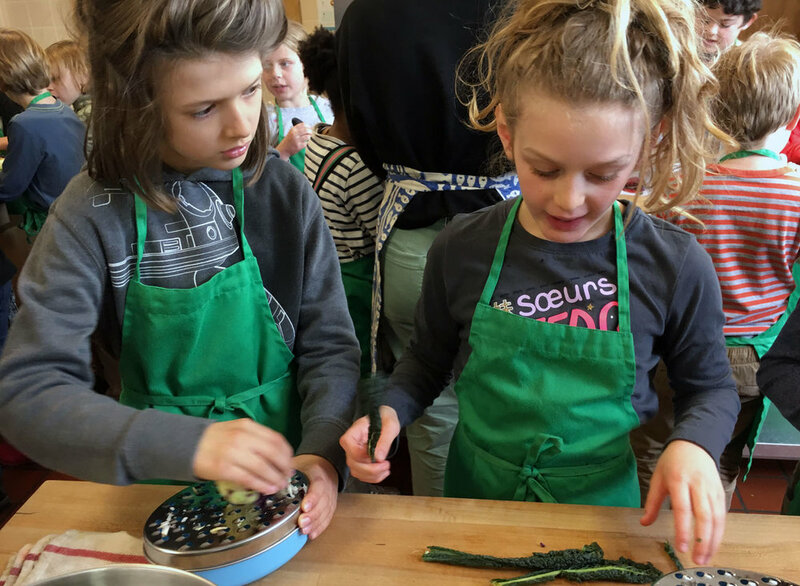 Many students were excited to realize that pickles can be made with practically any ingredient you want, not just with cucumbers. While our pickling brines were cooling, we did a tasting of sweet peas, comparing freshly shelled and blanched ones with peas that had been canned, frozen, and freeze dried. We looked at the cost of each process and talked about pros and cons of each type. Canning, for example, allows peas to have a long shelf life and is a good candidate for an earthquake emergency kit you plan to store for many months if not years. Freezing, on the other hand, maintains the vibrant color of the peas, but will expire sooner than canned peas. We’ve made a number of delicious Mexican breakfasts in the school kitchen over the past few semesters, but never simple yet satisfying huevos rancheros. The dish was so popular we had several chefs waiting at the door at 8 a.m. asking if they could come to class even though they had cooked the morning before! One group fried the tortillas while another group made pico de gallo, a fresh salsa that is also known as salsa Mexicana for its tribute to the colors of the Mexican flag. By now students are pros at frying eggs, so the meal came together quickly: they spread each tortilla with refried black beans, topped it with an egg and the salsa, and garnished with a squeeze of fresh lime juice, sprigs of cilantro, slices of avocado, and some pickled onions we had leftover from last week’s class. All three mornings the atmosphere was calm, collaborative, and fun. 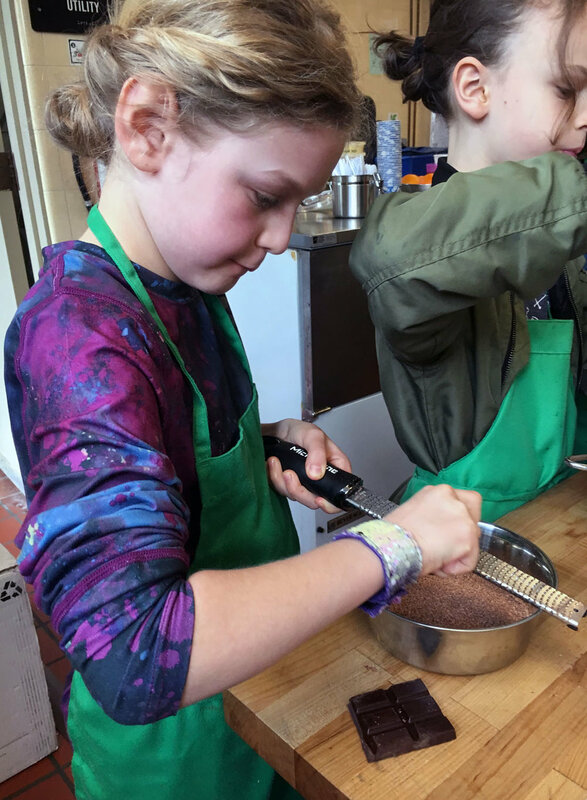 I’m really proud of how far our young cooks have come since the beginning of the year. ¡Salud! 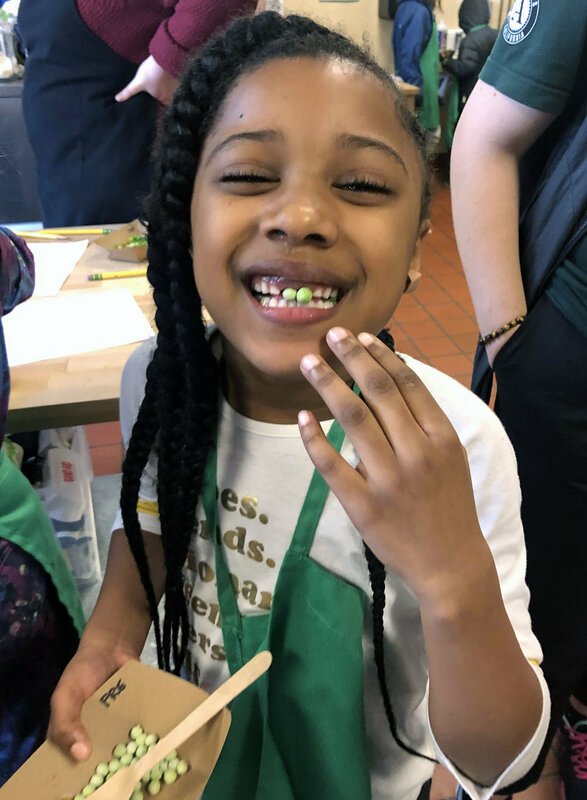 This week we worked with another popular member of the Brassica genus, collard greens, and a rare ingredient in The Breakfast Project kitchen, bacon! We discussed the culinary tradition of eating stewed greens with bread to soak up their cooking juices, which is found in many countries across the African continent. Starting in the 1600s, enslaved African people took the ingredients they had access to in Colonial America and applied traditional cooking methods from their homelands, creating new dishes that had never existed before. We watched a video of Dadisi Olutosin, a chef from Atlanta, Georgia, talk about the collard greens he grew up eating in the South and how he now prepares the dish with overt Caribbean and West Indian influences like peanuts and coconut milk. There’s no denying the results are delicious when you wait for collards to become tender and you achieve the perfect balance of savory, tart, sweet, and heat from bacon, vinegar, sugar, and hot sauce. 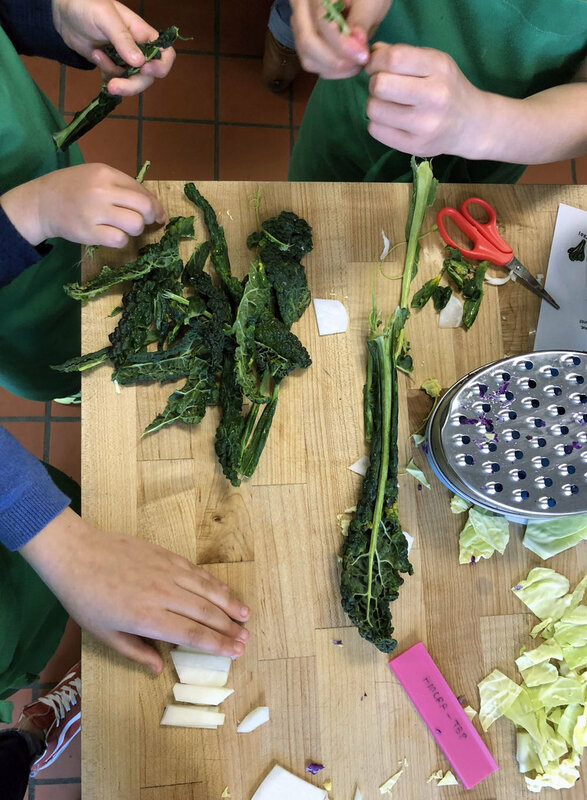 The collards the second graders prepared were featured last night at the Black History Dinner and Honor Roll Celebration. It was really meaningful to see students take such pride in sharing their work with their families! 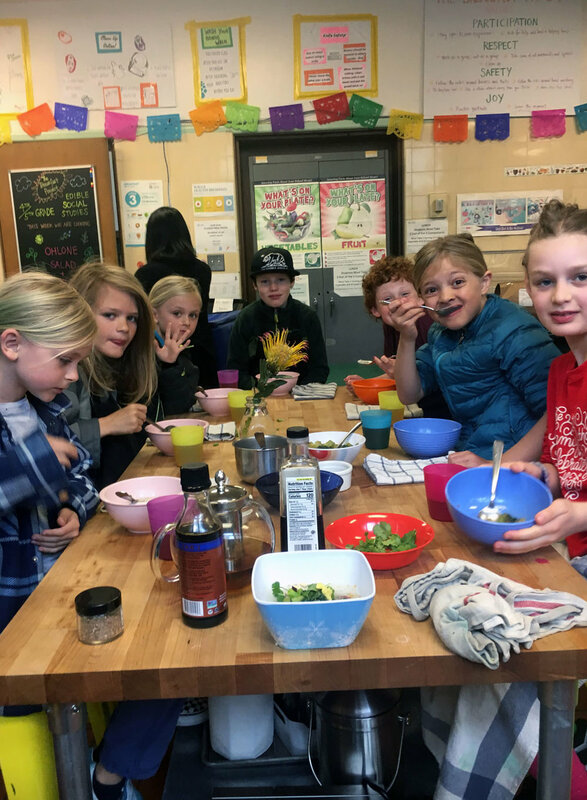 The first thing a student said on Tuesday when we introduced the country and recipe for the day was, “Aren’t avocados originally from Mexico?” Beaten at our own game, we had some explaining to do. Avocados are from the Americas, and eating avocado with grains has been around for thousands of years in both Central and South American indigenous cultures. In the early 1990s, a restaurant in Sydney popularized the “avocado toast” that we now find all over the Bay Area and on social media. This week, we pickled our own onions and made fresh ricotta as a nod to Australia’s contribution to this larger-than-life food’s story. 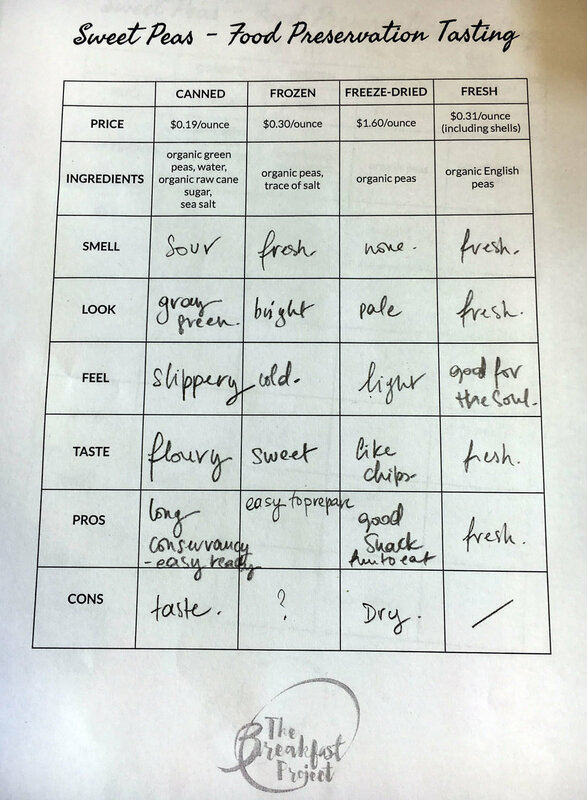 Over three days of classes, we had lots of variations in humidity due to the rainy weather and subsequently got totally different results with our cheesemaking. 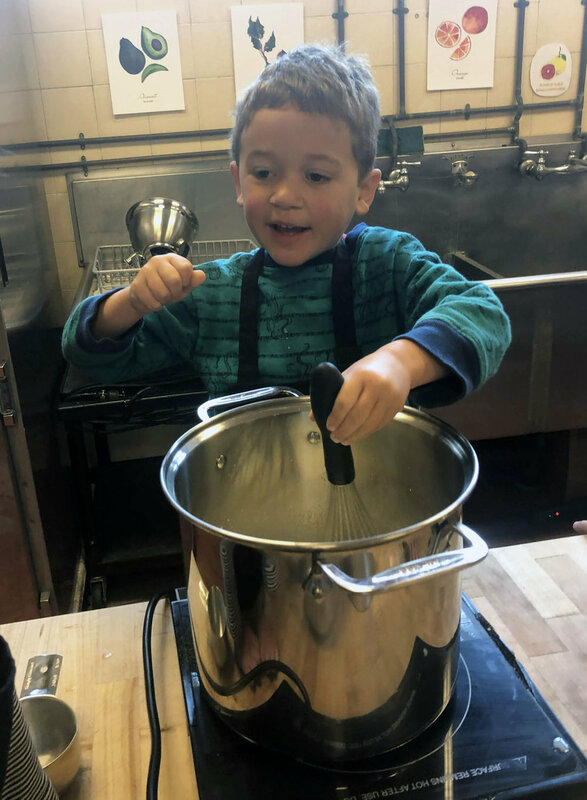 It got us thinking about offering a food science-themed class this fall where students can go deeper in their exploration of what variables affect the cooking process and the finished result. What do you think? We had lots of extra pickled onions on Thursday and happily served them to the full house at the Black History Dinner and Honor Roll Celebration. They might make a comeback next week, too, when we make (yet another?) dish from Mexico. 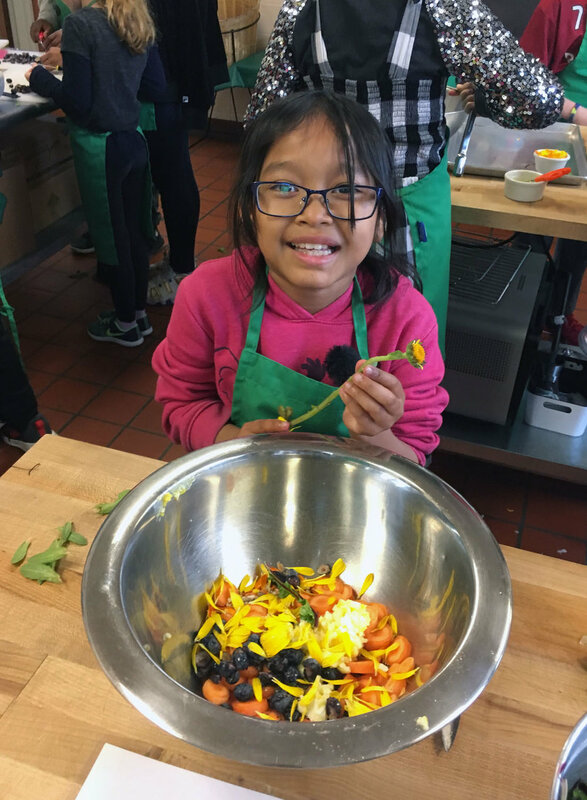 We had a great crew this week for our after-school class featuring a roll from the Philippines called lumpia. 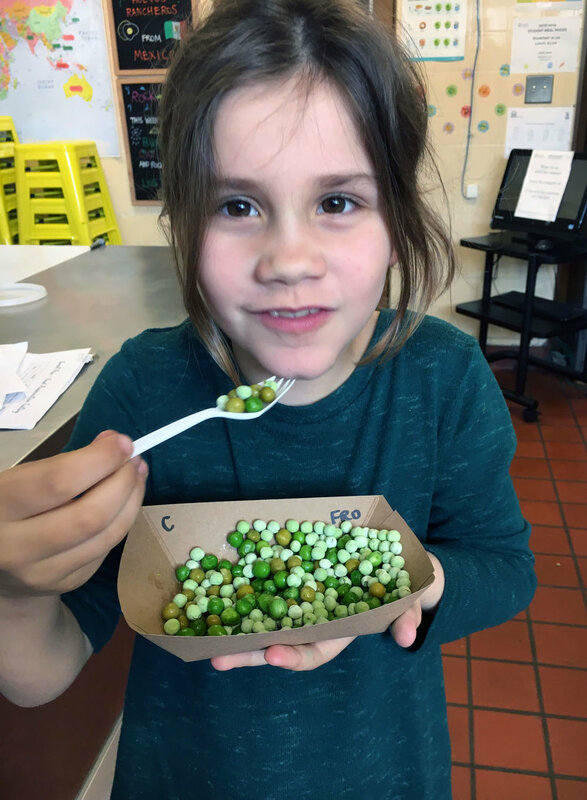 You can put any vegetables of your choice inside; we used sugar snap peas, Japanese sweet potato, carrots, cabbage, and mung bean sprouts. 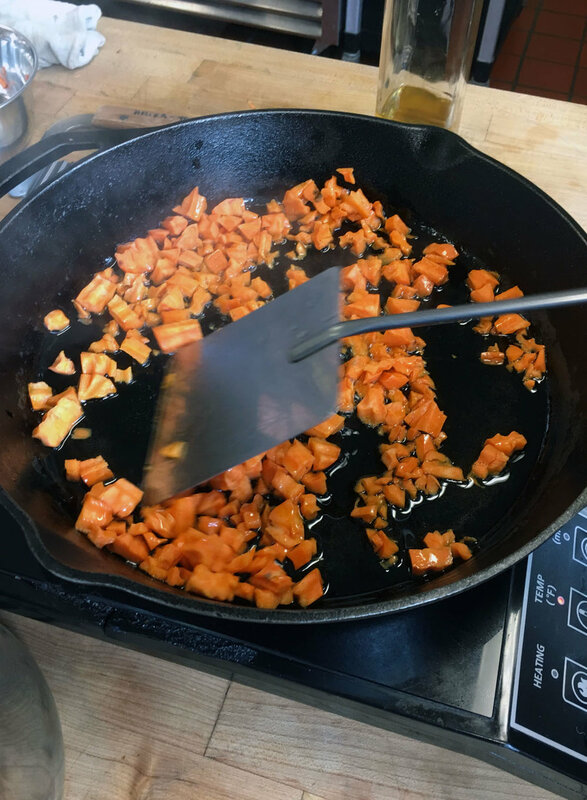 First, the students prepped the filling ingredients, then we stir-fried the mixture over high heat in a wok, adding a simple sauce of soy sauce, cornstarch, and brown sugar. Thus far our rolls have had round wrappers (i.e. tortillas, roti, rice paper) or a funky shape like a grape leaf. Lumpia wrappers are square. Our pro chefs made 25 rolls per table in no time, then we fried them in avocado oil and enjoyed them with a simple dipping sauce made from vinegar, sugar, soy sauce, and sambal chili sauce for a little heat. 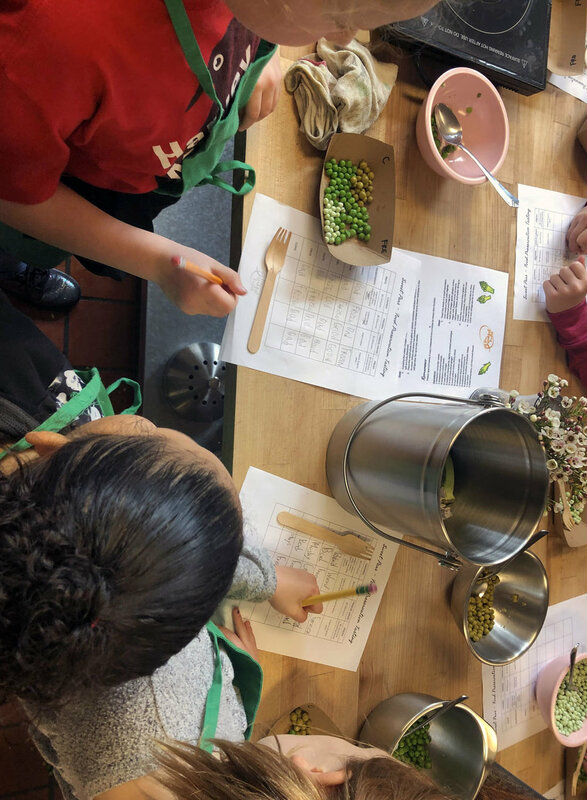 It was a rewarding class because many of the kids were familiar with the Chinese spring roll (the precursor to the Filipino lumpia) as a food, but none of us had ever made them from scratch before. We were too busy enjoying the finished product to remember to document how beautiful the golden brown rolls were at the end of class, but you can use your imagination! 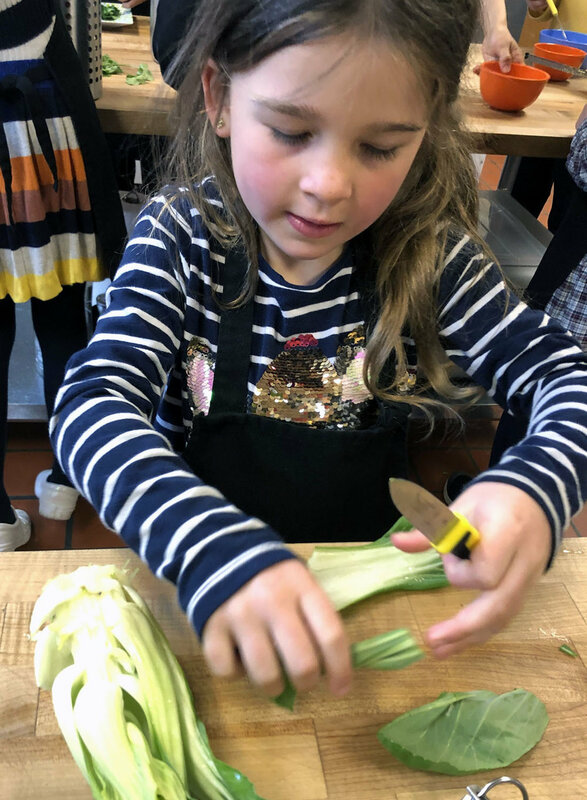 Continuing on our journey exploring local winter produce, this week we made a recipe that featured the Brassica genus of plants, also called cole crops or cruciferous vegetables. The word cole comes from the Latin word caulis, which means “stem” or “stalk,” and the word cruciferous comes from the New Latin Cruciferae, which refers to the plants’ cross-shaped flowers. In the Bay Area, we are lucky to be able to grow Brassica vegetables year round, but in the winter, the many different varieties available can make an otherwise slow-producing time of the year particularly exciting. Brassicas include common household favorites like broccoli and kale, but also include wasabi, rapeseed (from which canola oil is made), horseradish, and mustard. 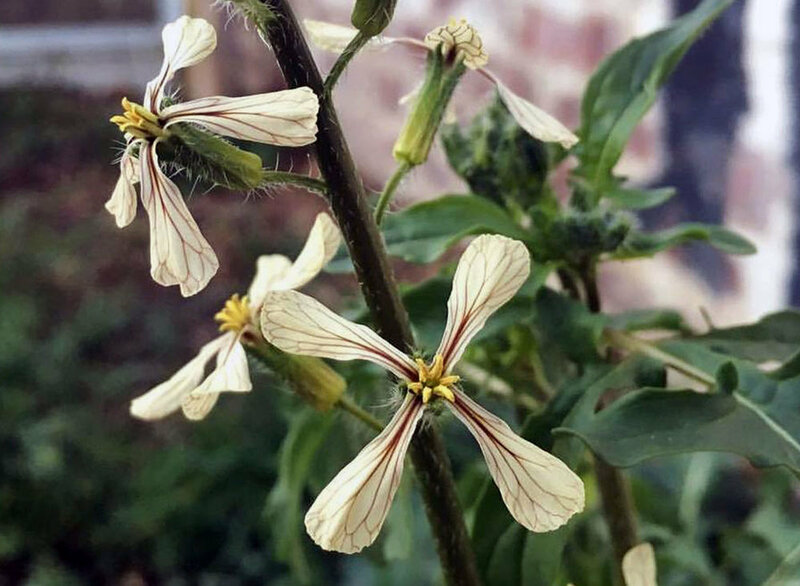 The students were very curious about how mustard comes from a plant, so we discussed how the cross-shaped flowers eventually become seed pods and how the seeds in turn can be ground up with vinegar and salt to make the condiment we are all familiar with on hot dogs. These pancakes are inspired by the Japanese dish okonomiyaki. Okonomi means “what you like” and yaki means “cooked” and this is a recipe you can put anything you want into. 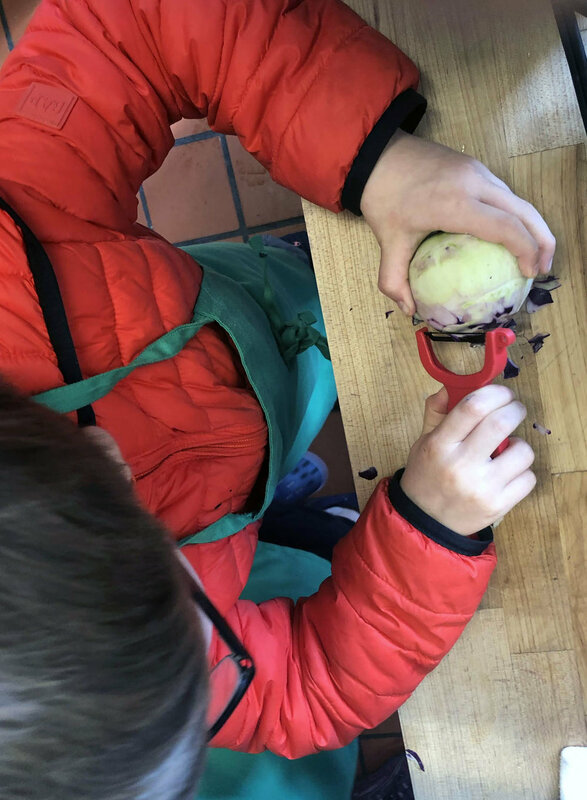 In class, we used Tokyo turnips, kohlrabi (which the kids loved snacking on raw), lacinato (aka dino) kale, purple and green cabbage, and green garlic (not a Brassica but it never hurts to throw a little taste of spring into a winter meal!). We also talked about how rich in vitamins Brassicas are and how eating fruits and vegetables that are deeply colored (like the kohlrabi and purple cabbage) is especially good for you. Like citrus, Brassicas are high in vitamin C, a particularly ingenious way for nature to help us fight off the flu and the cold during the winter months. Before heading into the kitchen, we checked in on the students’ cured squash seeds from last week. We watched a short video featuring Eatwell Farm founder Nigel Walker talking about saving seed. Ms. Reynolds mentioned that her students will be starting the seeds in the classroom for transplanting when it’s warmer either at home or in the school garden. Next week will mark the one-year anniversary of the first class we ever taught as The Breakfast Project. That first week we made waffles with the kids, and we’ve decided we’re going to make it a tradition during a week in February from now on in celebration of the milestone. This overnight recipe is versatile (use any combination of grains as long as you keep about half of the base all-purpose white wheat flour) and delivers a ton of flavor due to the long fermentation process. It’s also a recipe young people can do every step of with confidence, including the most important one - licking the whipped cream bowl at the end! We discussed the official languages of Belgium and looked at a map of Western Europe, noticing how French, German, and Dutch are spoken in the countries that border Belgium as well. A couple of our students used to live in Belgium and could attest to our fun fact about the mind-boggling large amount of chocolate sold in the Brussels Airport every day.